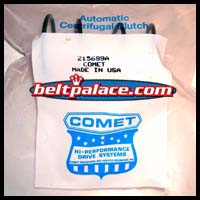 Home > COMET INDUSTRIES BELTS > COMET 203596A BELT REPLACES 994-105 Comet 30 Series > Comet 215699A "Green" Torq-a-Verter2, 30 Series Spring. Manco 6805. Comet 215699A "Green" Torq-a-Verter2 Cam Spring for 30 Series Driven. Comet 215699A "Green" Torq-a-Verter2 Spring for 30 Series 6 inch or 7 inch Driven Clutches. Replaces MANCO PART 6805. 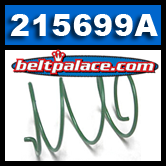 For Comet TAV2 30 Series - Asymmetric: This "Green" Comet Torq-a-Verter Lower Torque Spring replaces Comet 215699-A and MANCO 6805, Kenbar 300-016, Baja Motorsports BB65-396. Note: This is Part #16 on owner's manual assembly diagram for 6" or 7' DRIVEN (lower) clutch. Genuine COMET part - MADE IN USA! Comet 203189A, Part# 12: Jam Nut for Torq-A-Verter.